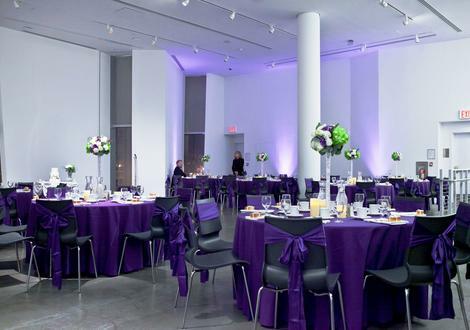 With sophisticated architectural accents and in-house lighting and sound, the Bronx Museum is a stunning and elegant space for all types of private and public functions. We can accommodate small to large events, from intimate receptions to business meetings to large-scale fetés. The museum is available for special events from Mondays through Sundays, 8:00 am to 11:00 pm. Please review below, our room features and FAQ. This unique, bright and sunny space with floor to ceiling windows and a terrace, is the perfect blank canvas to explore unlimited possibilities for social events. Equipped with an overhead projector, screen, in-house lighting and sound, this event space is also excellent for film screenings, seminars, workshops and other business events. A semi-public event space with direct views of exhibiting artwork. Our North Wing Lobby is a prime location for cocktail hour, networking, as well as meet and greet events. Available for use on Mondays and Tuesdays or when booked with our North Wing, 2nd Floor event space. Our largest room is a flexible space that gives you a raw, loft-style feel with high-ceilings and wood floors. It features a 350 sq. ft. stage which is commonly used to host events such as; live performances, graduations, conferences, training sessions, but also used for large wedding receptions, birthday parties, baby showers and much more! A private event space located on the ground level, encased by a glass roof and windows. An ideal option for a cocktail reception. This space is only available for use when booked with our South Wing, Lower Gallery. 1. What type of events are held at the Museum? We host a variety of corporate and social events, such as; galas, cocktail receptions, conferences, training sessions, holiday parties, wedding ceremonies, bridal showers, baby showers, rehearsal dinners, anniversaries, as well as Sweet Sixteens. 2. Are fundraising and political events allowed? No fundraising or political events are allowed. 3. Are film/photo shoots allowed allowed in the Museum’s galleries? Please send an email to rentals@bronxmuseum.org to inquire about film/photo shoot rates. All requests must be submitted in writing at least 2 weeks prior to filming.Film and photo shoots in the gallery requires approval and is determined on a case by case basis. 4. What days can events take place? Rentals can be held Monday through Sunday from 8am to 11pm. 5. How many event spaces are available for rent? We have 4 event spaces available for rent that can accommodate a capacity of 10 people for an intimate business meeting to 275 people for a large cocktail reception. 6. What days are available for site visits? Site visits are scheduled by appointment only. Upon receiving your inquiry request, our Rentals Manager will provide a price quote and schedule an appointment to conduct a site visit. 7. How much does it cost to rent a space at the Museum. 8. What is required to hold a space for an event? A signed contract and a 50% deposit is needed to confirm all rental bookings. 9. Is event insurance required? Yes, we do require General Liability insurance. 10. Are food and beverages allowed? Yes, outside food and beverages are permitted. 11. Does the Museum have exclusive vendors? No. Clients are allowed to bring in outside vendors as long as companies meet our requirements and adhere to our policies. We do have a list of preferred vendors to assist clients in the vendor selection process. 12. Does all of your rental spaces provide access for persons with disabilities? Yes. 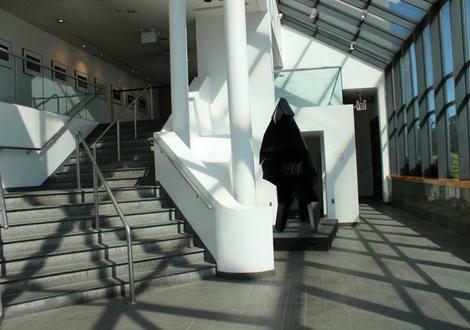 Our facility is equipped with elevators and ramps throughout the Museum. 13. Does the Museum provide parking for guests? The Museum does not have a dedicated parking lot for guests, but street parking is available as well as a nearby MPG Garage. 14. How do I submit an inquiry for more information? Please click here to complete our Facility Rental Inquiry Form. 15. How can I support the Museum? When you rent a space at the Museum, you provide support for all of our public program events and other services offered at our facility. An additional way to support is through our Membership Program!